The American Human: Over the Past Thirtysome Years, the Government Lowered Taxes. With What Result? Over the Past Thirtysome Years, the Government Lowered Taxes. With What Result? helping jump-start income inequality? For starting the trickle down that never did? Have wages gone up for the middle class? No. Have the wealthy gotten wealthier? Heck yeah. Do we think our government services are better? No. Do we think government is more effective? No. So why did we cut taxes? So life would be better in America? Maybe so. Did it work? Doesn't look like it. What are the chances we'll raise taxes on the wealthy to achieve a more equitable society? Not likely. What are the chances we'll pass laws that encourage labor unionization, even though we know that the demise of the labor movement coincided with the long slide into stagnant wages? Not likely. Unions have become very unpopular, even demonized. Let's do a Harpers sort of thing. The last two charts are very telling: Historically, income inequality in the U.S. tracks top marginal tax rates. 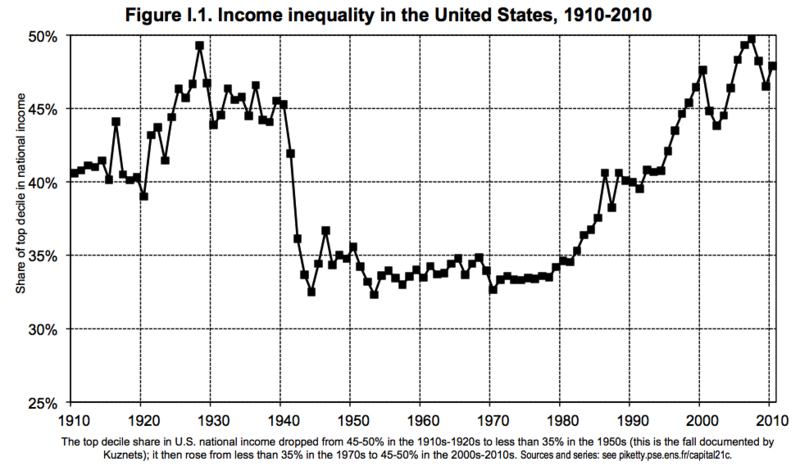 Look at income inequality's rise since 1980. 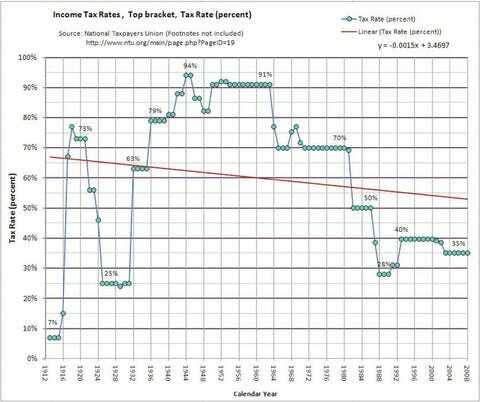 That tracks the continuously lowered tax rates beginning with Reagan and ending with Bush II, with an assist from Obama, who only restored the higher tax rates on the very highest earners. Now compare this with the flatness of the minimum wage increases over time. In fact, in real dollars, the minimum wage is below where it was in the 1970s. In addition, the lowest four quintiles have nearly flat wage increases, while the top quinitle does markedly better. The top 5% put the rest in the dust. In truth, a large portion of the top 5%'s income rise is actually due to the terrific increases in those of the top 1% and even the top .1%. As the minimum wage has lost ground since the 70s, and wage growth in general has been flat since then, it's not surprising seeing union participation begin to fall in the 1970s, as well. The union movement in great part gave us the American middle class. Now its decline tracks the decline of the middle class. You don't have to be a fan of unionism to see the connection. Look, finally, at the the graph that shows household after-tax income and expenses. The bottom two quintiles make less than their expenses. How could this be so? Either the poor and very poor get by with food stamps and other assistance, or they acquire debt, sometimes at exorbitant rates from Payday loans. A third component is that some of the bottom two quintiles are seniors spending down savings. Some estimates place this share at 25% or fewer of Americans. Senior poverty is rarer these days, for obvious reasons. In any event, the poor and very poor, whether seniors or not, don't make enough to get by without assistance or acquiring debt or spending down savings. 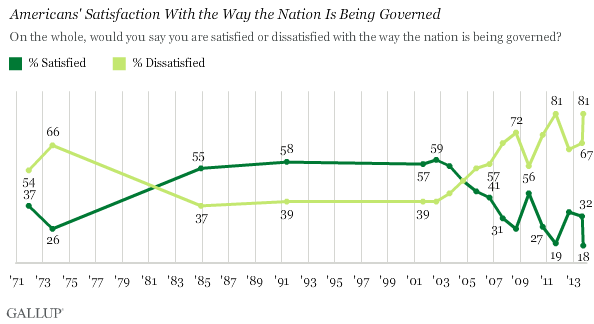 The first chart shows satisfaction with government at an all-time low of 18%. 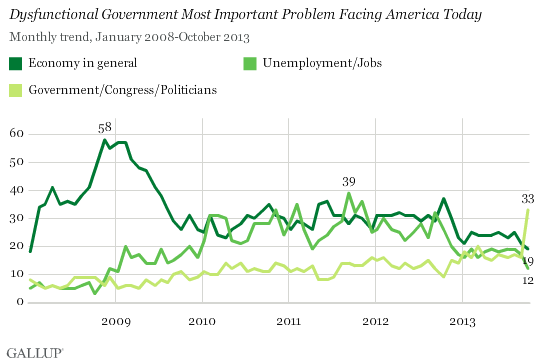 The second chart shows "dysfunctional government" being the number-one problem facing America, easily surpassing the economy or jobs. My conclusion: If real wages are flat or even falling for some quintiles, and taxes on the rich are considerably lower than when Reagan began slashing them in 1981, and the wealthiest Americans are even more wealthy today than at anytime since just before the 1929 stock-market crash, and satisfaction and opinion of government are at historic highs, why would anybody believe that our economic policies have been wise in the past 35 years? Raise the minimum wage to as high as $12, even $15. Encourage unionism to support middle-class-level wages. Raise taxes back to pre-Reagan levels. Spend new revenues on discretionary non-defense spending, especially on education, job training, health care, safety-net programs, and shoring up, not cutting, Medicare. Social Security can be extended nearly indefinitely by raising the cap on FICA taxes. And, yes, by all means, pour money into infrastructure spending. That supports the economy and encourages businesses to locate in the U.S.
States should find a way to make college more affordable, even free. Europe does it, Australia does it. So can we. I don't even have to present graphs about rising college tuition or rising student debt, but they're a huge part of our current dilemma. Education has always been touted as the portal to the American Dream. That portal is slammed shut for many Americans, and those that build up huge student debt are being denied an easy entry into the American economy. In fact, they're a principal drain on the American economy. Fix higher education spending, and fix the economy at the same time. A last comment: If you look at the satisfaction with government chart, you see that the figure went negative around 2005. That, friends, is Hurricane Katrina. Why? That was the turning point. George W. Bush's performance was so bad that his numbers plummeted and along with them trust in government, from which its reputation has never recovered. It's funny. Satisfaction and trust in government don't historically track the level of taxation. If the government is effective, people don't mind paying taxes. That's been true since taxes first started being collected. 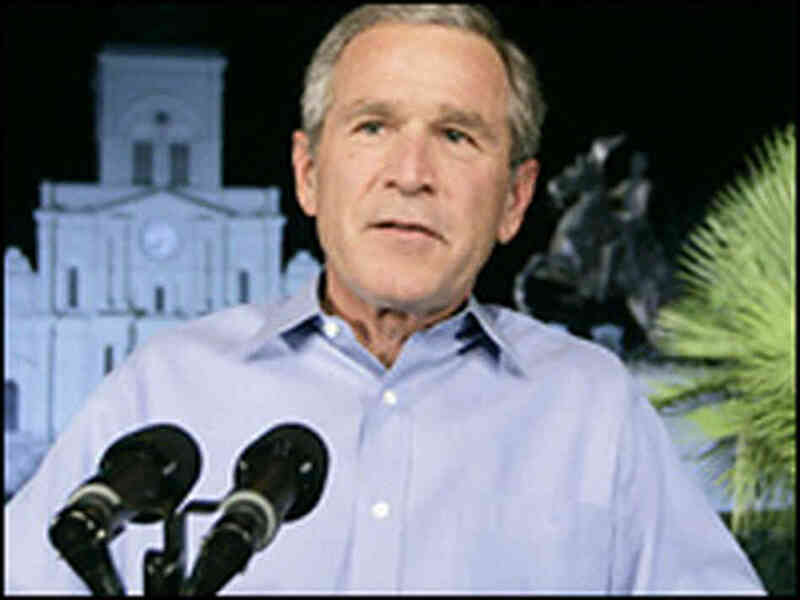 George W. Bush looking at Katrina damage: The moment trust in government ended. Bush in Jackson Square. Hopelessly clueless, and people stopped believing. Heckuva job. We can do better. We must. What needs to be done, only government can do. Time to get to work, actual work.